Always have a lighter when you need it, and never dig through pockets, bags or purses to find it. This handy little holster will grab your lighter securely, and allow you to attach it in a convenient location. 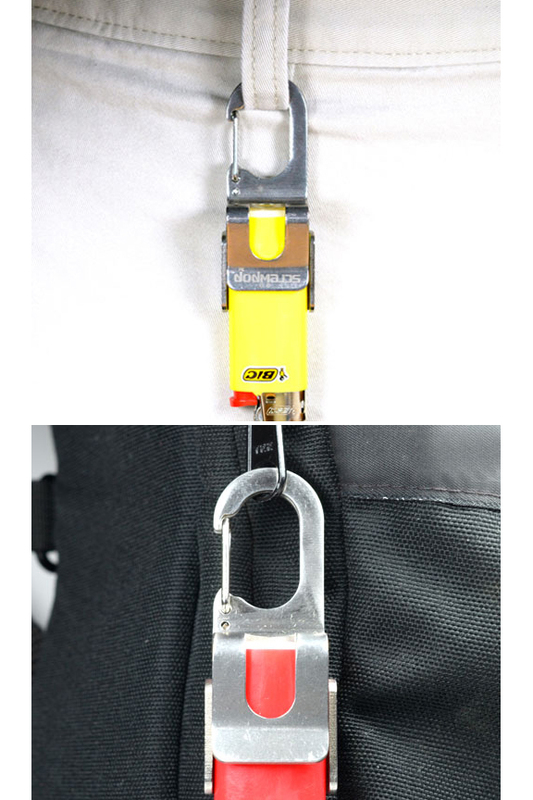 It works great as a key chain, but you can also clip to backpacks, luggage, belt loops, zippers, cords and more. Keep one in a convenient place in your home or vehicle for occasional use, or keep one in your pocket all day long for frequent fire needs. It's also the perfect companion when on the go, or out in the wilderness. Add to your camping gear or bug out bag to guarantee fire when you need it. The powerful clip is made entirely of high quality stainless steel, and it's manufactured in the USA for superior quality. A strong tension bar will provide a snug fit that guarantees the lighter won't slip out, and a universal carabiner clip allows for attachment almost anywhere. 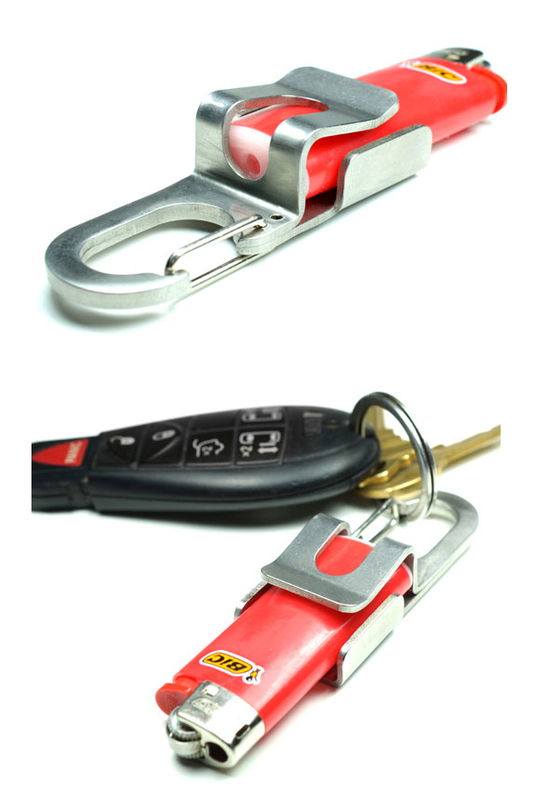 Simply slide your lighter in, and then quickly clip to your keys to begin using it. The compact size does not add bulk, and there is not need to take your lighter out to use it. Durable materials, and superior design result a tool that will last a lifetime, even with constant use. Perfect for a variety of uses, this handy clip ensures convenient storage of an essential tool. Use it as designed, or be creative to discover all of the options it allows. The list below includes some of the most popular applications, but you can use it for anything else that is similar too. High Quality. Made in the USA this holster is cut and molded from a single sheet of stainless steel. There are no little parts to break, and no plastic to smash. The simple design provides a tight hold, and it will never wear out or break with use. Multiple Uses. As if an always-there lighter solution was not handy enough, this little guy also works as a bottle opener to add even more value and ability. 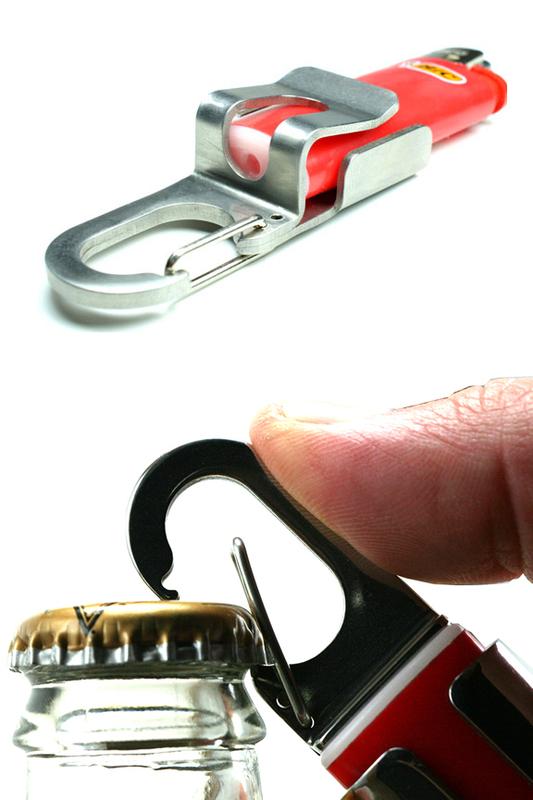 Just pop open the clip and then pop open your beer or soda with ease. Easy To Use. Your lighter will slide right in, and the holder itself does not hinder use. Quickly attach to just about anything with a flick of your thumb. Anyone can use this device to make lighting things on fire quick and convenient. Durable. Sit on it, drop it, kick it, or let it roll around with the rest of your gear. This sturdy holder will not bend or break, no matter how you treat it. The simple and rustic design will look great and work like new for many years to come. Goes Anywhere. Connect to your keys, attach to your pants, or clip to your purse, the possibilities are endless. Ultra compact, and super lightweight, this essential travel companion will be right where you need it at all times, but unnoticeable when you don't. Strong Hold. Despite the simple method employed, the bond created is incredibly strong. Slide it in and out of your pocket time and time again without any worry that it might slip out, or go missing. So simple to use that instructions are not necessary. Anyone can pick it up and begin using it within a matter of seconds, but follow the tips and steps below to ensure proper function and maximum value. Designed for use with mini size Bic lighters. Make sure you have a compatible lighter prior to use. Others of a similar size may work fine, but chose Bic for a fool proof installation. 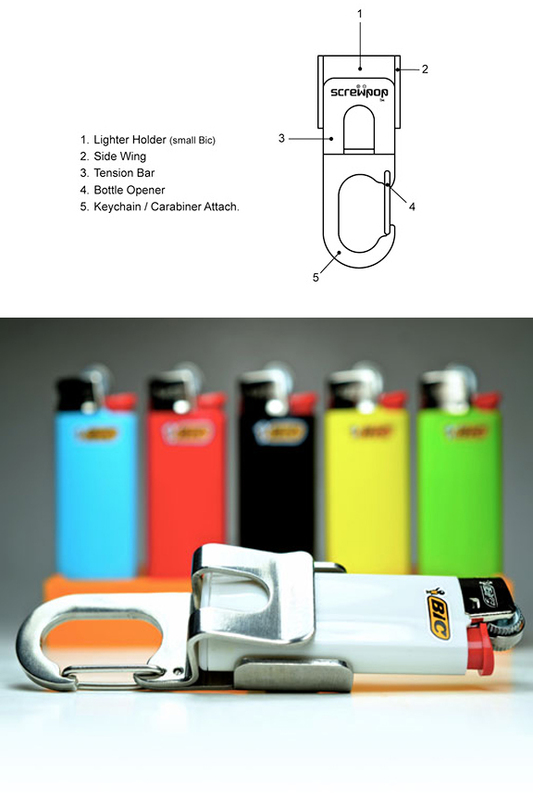 To install a lighter, simply press and slide into the holder, and under the clip. Push all the way in. Once in place, the lighter will remain secure until you take it out. To remove it, simply slide it back out. Slight upward pressure on the tension bar will allow it to slip out easily. To attach to anything, open the clip, slide into place, and then press the clip back to the closed position. To use as a bottle opener, open the clip, and use the opening to grab the cap. Rotate upwards to lift it off. Stop fumbling for your lighter each time you need it. This product is ideal for smokers, but useful for anyone that ever lights a fire. Instead of sifting through the other stuff in your pockets, or digging to the bottom of your bag, you could quickly flip this out and be about your business. Camp fires will light sooner, cigars will fire up faster, BBQ's will burn without frustration, and you will avoid the buzz kill that becomes inevitable as you struggle to find a lighter that is lost. Never wonder again, and avoid future annoyance as you keep your lighter right where you want it, and always at the ready. Uses Secure and hold lighters. Allows for attachment almost anywhere. Clip opening also works as a bottle opener. Compatibility Designed for use with mini size Bic lighters. May work with other similar size products. Securing Method Strong tension bar holds on tight. Never lose your lighter, and always have fire in a moments notice. Perfect for anyone that smokes, but also ideal for preparedness when camping or backpacking. Attach to bags, belt loops, purse straps, key chains and more. Order Yours Today!